“Legal migration for work and training: Mobility options to Europe for those not in need of protection” is a project of the Research Unit of the Expert Council of German Foundations on Integration and Migration in cooperation with the Migration Policy Institute Europe, funded by Stiftung Mercator. Given large-scale irregular migration flows to Europe, the central question is what legal alternatives do and could exist for third-country nationals who are not in need of protection and who move for education, training and or work. Through a combination of five country case studies (France, Germany, Italy, Spain, Sweden) and analysis of the European Union’s external migration policy, the project explores existing legal migration options, challenges in policy design and implementation, and reflects on the options for the development of effective legal migration policies and programmes. Project results will be made available in a series of shorter publications between December 2018 and June 2019. The final study is scheduled for release in English and German in autumn 2019. The current public debate revolves around terms such as ‟trust”, ‟cohesion” and ‟participation”. ‟Politics” and ‟democracy” are deemed to be in crisis, and there is a general feeling that politicians are disengaged from voters. Many people (with and without a migration background) are at a loss to understand the political issues of the day and ask themselves things like ‟Do I actually understand important political issues?” and ‟Do I feel that politicians are really interested in me and what matters to me?” How, then, do citizens rate their ‟political self-efficacy” – and what does that mean in terms of their getting involved in politics and trusting the democratic system? Among other things, the 2018 Integration Barometer asked people with and without a migration background about their political literacy and how they perceive their means of political influence. Their answers are now being assessed as part of a cooperation project with the German Centre for Integration and Migration Research (DeZIM Institute). The project provides a means of comparing those with and without a migration background as well as in-depth findings on specific groups of origin. The cooperation project is being sponsored by the German Federal Ministry for Family Affairs, Senior Citizens, Women and Youth (BMFSFJ). The SVR Research Unit and the DeZIM Institute will be publishing the project results in a joint Policy Brief in the second quarter of 2019. Immigrant organisations are important civil society actors in Germany. Their remit and their understanding of themselves now go well beyond merely supporting their ‟own” community. In the course of ongoing social and political changes this extremely heterogeneous organizational landscape is changing, too. New kinds of organisation are emerging due to the arrival of new migrants, and there is also a trend towards forming umbrella organisations and new types of immigrant organisations. 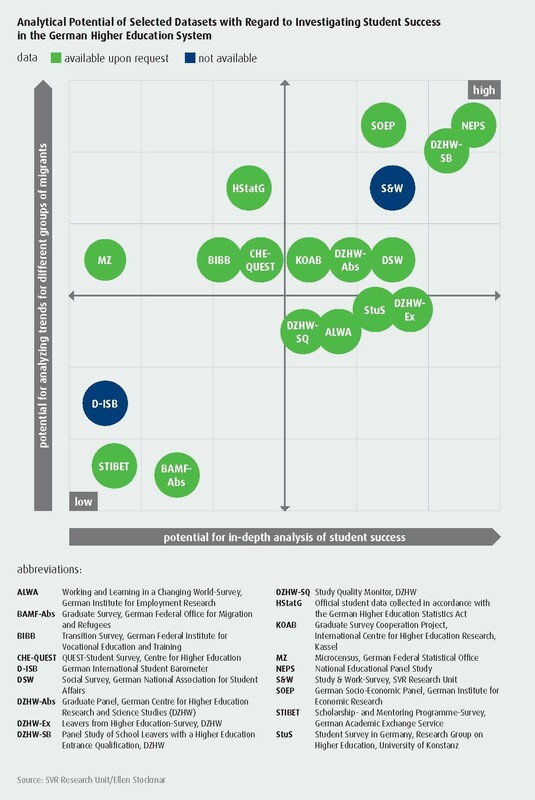 However, there are serious gaps in research on the quantitative importance of these organisations, how they differ and what determines their approach to integration. The SVR Research Unitʼs two-year study project aims to help close these research gaps. Its objectives are, first, to provide a quantitative overview of existing organisations and, second, to conduct a qualitative analysis of the changing landscape and the associated opportunities and risks. The goal is to draw up recommendations for action for policymakers, administration, interest groups and civil society, especially when it comes to optimising funding structures for immigrant organisations. The project is being sponsored by the Federal Ministry of the Interior, Building and Community. Research results are expected to be published in late 2020. Between 2015 and 2016, more than 2.2 million teenagers and young adults migrated to or within the European Union. Given their oftentimes interrupted education, access to schools and vocational training programs is crucial for these 15- to 24-year-olds. In this research project, The Expert Council’s Research Unit compares the educational opportunities of young refugees and other newly-migrated 15- to 24-year-olds in selected member states of the European Union. The research focusses on (barriers to) access to secondary and post-secondary education as well as salient pathways and support services for newcomers. The two-year project is funded by Stiftung Mercator. Initial findings are published in late 2019. The final report will be published at the end of 2020. The transition from primary to secondary school is an exciting time for most pupils. Some, though, will feel apprehensive about starting a new school because they are afraid of failure and of not being accepted. Pupils with a migration background and those with a difficult social background are especially prone to such fears. Their lack of trust in themselves and others can lead to a significant drop in performance. However, starting a new school can also be a great chance for a fresh start and to establish trusting relationships between teachers and pupils. This transitional phase thus presents teachers with opportunities to effectively lay the foundations so as to ensure that new pupils feel they belong and are motivated to actively take part in lessons throughout their time at school, despite the occasional set-back. Teaching strategies to help strengthen pupilsʼ motivation are being developed and evaluated as part of a research/practical project and will then form part of a toolkit which will eventually be used in teacher training and further training. One item in the toolkit is the ‟self-affirmation intervention”, a method first tested in the United States which has been adapted to the German school system. The research project is funded by Stiftung Mercator. Research results are expected to be published in late 2020. Children’s educational success and participation in society are rooted in their early childhood development. Parents, as the people children relate to most, lay the foundation for their children’s educational careers which can create special challenges particularly for migrant parents. Day care centres can give parents a lot of help bringing up their children. The project aims to identify the function of day care centres and what they can offer in terms of parent education. The project looks at the general access families with a migration background have to institutional day care facilities, what kinds of parental education services day care centres offer and the necessary prerequisites for these services and whether migrant families make use of these services. The project was funded by the Vodafone Foundation Germany. The final results were published in December 2014. Obstacle Course to Day Care. Why Parents with a Migration Background are Less Likely to Send Their Children to Day Care. What Motivates People to Emigrate from and Return to Germany? In the context of increasing globalisation and transnational migration, the international mobility of Germany’s population has received more attention from policymakers, researchers and the general public. The goal of this research project is to collect accurate information on key motivations of emigrants and returnees that could be used as a basis to develop an effective policy for reducing the loss of skilled labour to emigration. The main component of the project is an international survey of German emigrants and returnees designed to identify the main reasons for which they decide to migrate. The research project will be carried out in cooperation with the Department for Social Structure Analysis at the University of Duisburg-Essen and the German Federal Institute for Population Research (Bundesinstitut für Bevölkerungsforschung – BiB). The research project was funded by the Stiftung Mercator and the cooperating partners. The project findings were published in March 2015. When it comes to attracting skilled foreign labour, international students are increasingly seen as ‘model immigrants’: They are well-trained, their credentials are fully recognized and many of them are already familiar with the language and culture of their host country. Recent studies show that many international students need additional support to successfully enter the labour markets of their respective host country. In theory, student support services such as international offices and career services are well-positioned to assist international students in their transition. In reality, however, very little is known about whether these service units actually adjust their support to the needs of international students, and to what extent they collaborate with local employers and government agencies. To find out more, the SVR Research Unit will conduct the first-ever international mapping of study-to-work related support services in four countries (Canada, Germany, the Netherlands and Sweden). By surveying key personnel at public colleges and universities in four countries the SVR Research Unit seeks to identify institutional facilitators in the study-to-work transition as well as the extent to which they collaborate. The research project was funded by the Stiftung Mercator and the Stifterverband. The results were published in the second quarter of 2015. The project was carried out in collaboration with the following project partners: the Canadian Bureau for International Education (CBIE), the German Academic Exchange Service (DAAD), the Career Service Netzwerk Deutschland (CSND), the Netherlands Organisation for International Cooperation in Higher Education (Nuffic) and the Swedish Council for Higher Education (UHR). Job market discrimination has particularly serious consequences because success or failure also affects the opportunities to participate in other areas of life. By administering a correspondence test (1,794 job training applications) this research project sought to collect data for the first time on the occurrence and scope of discrimination when applying for training positions, including possible causes of and mechanisms for discrimination. The results should be directly usable for practice: training companies, applicants for training positions, chambers of commerce and industry, chambers of trade, actors in transition management and political decision-makers can all benefit in equal measure. The research project was funded by the Robert Bosch Stiftung. The results were published in March 2014. The number of people seeking asylum in the European Union is on the rise – and refugees continue to be confronted with widely diverging standards in the individual member states, be it in terms of reception conditions or the asylum procedure itself. Furthermore, the EU is still far from having a common practice for asylum decisions and thus a uniform protection level. So far, no EU-wide mechanism exists to ensure a more even distribution of asylum seekers. The objective of this joint research project by SVR’s Research Unit and the German Institute for International and Security Affairs (SWP) was to develop a multi-factor model which is capable of calculating fair refugee reception quotas for every member state based on its economic strength, population, size of territory and unemployment rate. The project was funded by the Stiftung Mercator. The final results were published in November 2013. Three in five foreigners in Germany come from a country outside of the EU. Unlike EU citizens who are allowed to vote in local and European elections, these third country nationals are excluded from political decision-making processes. This project sought to examine to what extent third country nationals are interested in voting in general elections at the federal level and identifies their potential participation in future Bundestag elections based on a special analysis of data from the Immigrant Citizens Survey (ICS) Germany conducted by the SVR Research Unit which surveyed around 1,000 migrants from third countries. Based on the analysis, the SVR Research Unit recommends a stronger push for naturalization and greater emphasis on German citizenship and voting rights. The project was funded by the Stiftung Mercator. The final results were published in August 2013. Segregation is no longer a marginal phenomenon at German schools, especially in urban areas. One of its negative consequences is to limit the educational opportunities open to migrant students. The research project took a critical look at the extent, causes and effects of school segregation in Germany. Based on an in-depth analysis of international student assessment data (PIRLS and TIMSS 2011) and geospatial data for the city of Berlin this project aimed to develop concrete recommendations for reducing the performance gap between migrant students at segregated schools and their native German peers. Rather than overemphasising top-down desegregation measures, both schools and school administration should invest more time and resources in strengthening parent-teacher collaboration, need-based school funding and language instruction across the entire curriculum. The project was funded by the Stiftung Mercator, which works towards the improvement of educational opportunities. The findings were published in July 2013. In times of (projected) labour shortages international students are increasingly regarded as ‘ideal immigrants’. Nevertheless, there is hardly any research on students’ intentions to stay in their host country. This research project examined factors influencing the staying intentions of international students. The project consists of a comparative review of the structural characteristics of migration policies and higher education systems, as well as a range of factors, such as the labour market and language, which may influence the propensity of foreign graduates to stay after completing their studies. The derived assumptions were empirically tested using an online survey of more than 6,200 international students in five EU countries (Germany, Sweden, the Netherlands, France, United Kingdom). The research project was carried out by the SVR Research Unit in cooperation with the Migration Policy Group (MPG). The project was funded by the Stiftung Mercator, which works towards the improvement of educational opportunities. The findings were published and presented at an international conference in April 2012. Although the second generation of Muslim migrants born in Germany is much better integrated than the first generation, the political and media debates are increasingly confined to the ‘failed integration of Muslims’. Based on an in-depth analysis of SVR’s 2012 Integration Barometer this project sought to assess people’s opinion of how Muslims are portrayed in the German media. Germany’s migrant and native population agree that the media image of Muslims in Germany is too negative. The SVR Research Unit recommends increasing the number of articles about Muslims in their regular day-to-day lives outside of the problem contexts. The project was funded by the Stiftung Mercator. The final results were published in March 2013. Within the scope of the “Immigrant Citizens Survey” migrants from outside the European Union were asked about their experiences in the areas of employment, language learning, political participation, residence status, naturalisation and family reunion. The aim of the project was to improve the understanding of integration processes. On the basis of the findings, recommendations were developed for how to better reach integration goals. The survey was carried out in Germany and six other European countries: Belgium, France, Italy, Portugal, Spain and Hungary. The study was funded by the European Commission, the King Boudouin Foundation (Belgium) and the Fundação Calouste Gulbenkian (Portugal). The project was coordinated by the Migration Policy Group (MPG). In the case of Germany, personal interviews were conducted with a total of 1,200 migrants from non-EU countries. The findings were published and presented at an international conference in June 2012. Collaboration between parents and schools needs to increase, but there is still a lack of a shared understanding of what exactly constitutes good cooperative work with parents. The project sought to come up with a practically-oriented list of criteria for good cooperative work with parents in schools. Schools that have not yet taken an in-depth look at this issue could orient themselves around these standards to structure cooperative work with parents at their schools and effectively integrate this work into their existing structures. The project was funded by the Vodafone Foundation Germany. The final results were published in March 2014. As a result of the rising number of refugees in Germany, policymakers, government authorities and civil society are confronted with the challenge of streamlining reception processes, providing adequate living conditions and encouraging social integration. But one voice is usually missing in the debates – the voice of the refugees themselves. Reliable information about their living situations, however, is urgently needed not only to tailor the asylum and reception system to meet their needs, but also to reshape the opportunities for social participation and de-emotionalise the public debate. The aim of the research project was therefore a scientifically based description of the current living situations of refugees in Germany from their own perspective. In qualitative interviews in several federal states (Laender), insights were collected on the needs and expectations of the refugees, what resources they bring with them and how they perceive their current living situation as well as their health and well-being. The study focuses on people with an uncertain residence status who have recently arrived in Germany. Based on the findings, recommendations for how to improve refugee reception and integration were developed that are relevant for policymakers at the federal, state and local levels as well as for government and civil society actors engaged in work with refugees on the ground. The study was conducted by the Expert Council’s Research Unit and the Robert Bosch Stiftung. The results were published in November 2017. Since 2011, the civil war in Syria has led to huge numbers of displaced people and refugees. According to the United Nations, Syria is now the biggest humanitarian crisis since 1945. Syria’s neighbouring countries have admitted 4 million refugees on their territory. In contrast, only a small number of Syrians has found protection in Europe or other industrialised countries. So far, Germany is one of the few countries which have accepted Syrian refugees in significant numbers in addition to its regular asylum system. Since 2013, three federal programmes have been launched, granting temporary protection to 20,000 people. In addition, 15 out of the 16 Länder governments have introduced programmes for family members (admission through private sponsors). A big advantage of Germany’s admission programmes is that they offer a save and legal entry to Germany whereas asylum seekers are in most cases forced to embark on the illegal and dangerous trip via the Mediterranean Sea. At the same time, Germany’s admission programmes show notable difference in terms of their conditions of access as well as the rights and obligations for relatives in Germany. This research project features a comparative analysis of Germany’s humanitarian admission programmes. In doing so, the project seeks to contribute to future developments of humanitarian admission programmes in Germany and beyond. The research encompasses the analysis of documents and official statistical data, as well as expert interviews. The project was funded by the Stiftung Mercator. The results were published in the fall of 2015. Schools are among the most important institutions for supporting the integration of immigrants and their families. However, many schools are under financial pressure as they attempt to close achievement gaps and provide effective support to high-need students—including second-language learners and recent immigrants, as well as low-income students and other vulnerable groups. In Germany, only a handful Länder employ a data-driven approach when it comes to providing extra resources to schools which enroll a high share of language learners and low-income students. This research project seeks to systematically assess methods of supplementary school funding in the 16 Länder as well as select jurisdictions in Canada, France and the United States. The research is conducted in partnership with the Migration Policy Institute (MPI). The project was funded by the Stiftung Mercator. The results were be published in early 2016.
International migration doesn’t just affect one single country. The international migration of labour in particular affects the countries of origin and destination in a variety of different ways. The international laws that govern migration, however, – unlike other global issues like trade or climate change and with the exception of the international refugee regime – are a patchwork quilt at best. The reluctance of governments to enter into multilateral treaties on migration is evident, e.g. in the very low ratification rate of the UN Convention on the Protection of the Rights of All Migrant Workers from 1990: until now, not a single destination country in Western Europe or North America has ratified this treaty. In the meantime, the debate about migration and how to deal with it, particularly in the context of “migration and development”, has been rapidly gaining momentum since the turn of the century. The milestones in this debate include the Global Commission for International Migration appointed by the UN (2003-2005), the High Level Dialogue on Migration and Development (2006/2013), the Global Forum on Migration and Development (GFMD) which has convened annually since 2007, the inter-agency Global Migration Group (GMG) as well as various initiatives of relevant international organisations. Germany is increasingly active in global migration policy; this is clearly evidenced, among other things, in its assumption of the role of co-chair of the 2017/18 Global Forum on Migration and Development together with Morocco. The research project thus aimed to illustrate the rapidly changing global governance of migration and the role of Germany in this process. It undertook an analysis of the actors, forums and interests involved to create more transparency and ultimately provide policy recommendations. The research project was initiated by the Bertelsmann Stiftung and the Expert Council’s Research Unit and was funded by the Bertelsmann Stiftung. The Bertelsmann Stiftung has increased its focus on issues related to fair migration management around the world and awarded the 2015 Reinhard Mohn Prize to Prof. Rita Süssmuth. The results of the research project were published in the spring of 2016. In Germany, immigrant students’ school performance continues to lag behind their native counterparts’ performance. Part of this gap has been attributed to low teacher expectations and discriminating classroom practices. However, in the case of Germany, these hypotheses are yet to be tested empirically. Consequently, it is still unclear which instructional practices and policy measures are most effective in helping immigrant students succeed. To address these knowledge gaps, the Expert Council’s Research Unit and the Berlin Institute for Integration and Migration Research (BIM) at Humboldt University conduct a mixed methods research project which investigates teachers’ diversity-related attitudes, student-teacher interaction and its effects on academic success. As a first deliverable, the project will develop self-affirming teacher classroom practices which can be used to address stereotype threat in various settings. The impact of these affirmative practices will then be tested as part of an experimental study at select German schools. The research project was funded by Stiftung Mercator. The findings were published in July 2017. In a democratic system, going to the ballot box is not the only form of political participation, but it is certainly the most important. While many scientific studies have in the past looked at the party preferences of the population as a whole, the voting tendencies of migrants have not been sufficiently researched to date. 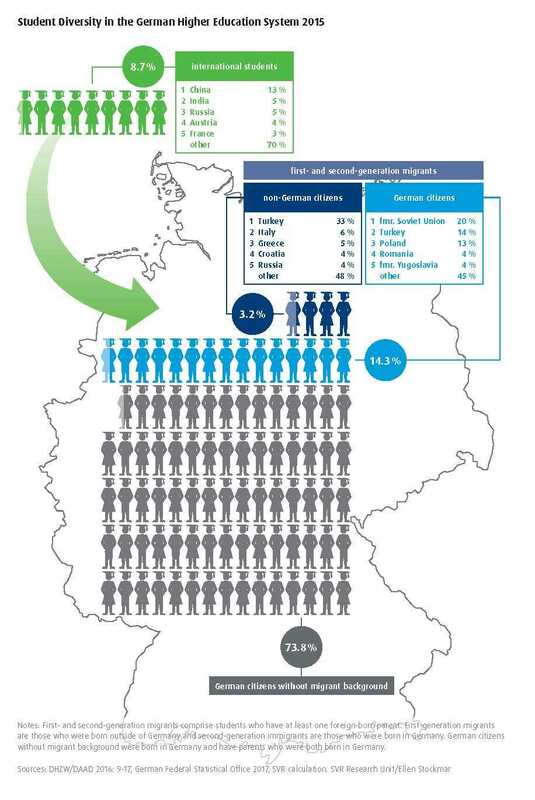 More than 19 million people with a migration background live in Germany. At the 2017 elections to the Bundestag the proportion of people with a migration background who were eligible to vote rose to 10.2 per cent – from 9.4 per cent back in 2013. Voters with a migration background are of major significance for democracy in Germany and will in future have an ever greater role to play in shaping the countryʼs political landscape. The project aimed to analyse the basic party orientations of people with a migration background based on the SVR’s Integration Barometer and to examine these with a view to future demographically driven shifts within the voter structure. The first analysis drawing on data in the SVRʼs 2016 Integration Barometer was published in November 2016. Publication was supported by the Federal Government Commissioner for Migration, Refugees and Integration as part of the Year of Participation. A second analysis based on data from the SVRʼs 2018 Integration Barometer, in which a comparison could to be drawn between the two surveys, was published in September 2018 (only available in German). Black, Red, Green. What are the Party Preferences of Immigrants? The German school system is facing an extraordinary challenge in integrating well over 100,000 children and teenagers who have sought asylum since the summer of 2015. Despite the remarkable efforts of teachers, school administrators, and policy-makers, many young refugees are unable to access a nearby school within the three months set forth by European Union law. Once in school, refugees are often taught in separate classrooms first in order to help them achieve a basic command of the German language before joining their peers in the general education classroom. While this practice has been criticized for hampering academic progress and the social integration of refugees, proponents point to the necessity of ‘safe spaces’ where students can learn the language and adjust to their new environment. To find out more about the pros and cons of different instructional models for refugees, the Expert Council’s Research Unit set out to conduct field research in five of the country’s 16 states (Länder): Baden-Württemberg, Berlin, Hesse, Hamburg and North Rhine-Westphalia. The exploratory project sought to shed light on the plethora of instructional models currently in use to teach refugees. Furthermore, the Research Unit planned to investigate instances of in-school segregation and teachers’ experiences with the newly arrived students. The project was funded by Stiftung Mercator. The results were published in March 2018. At local level, the increase in the influx of refugees is linked, on the one hand, to short-term financial burdens and, on the other, to medium- and long-term opportunities. In terms of integration policy, the question arises as to how the refugees are distributed throughout Germany. Particularly in rural areas in eastern Germany, many refugees, once their status is recognised, move to large cities like Berlin, Düsseldorf or Hamburg where many of their compatriots have already formed communities. The research project aimed, on the one hand, to gain insight into the challenges that emerge at municipal and county level when refugees move from their original location. On the other hand, it aimed to analyse the general conditions under which – despite some considerable structural weaknesses in the labour market and infrastructure – integration efforts lead recognised refugees to make their homes in the communities. To this end, available data was evaluated in an exploratory study and policy management options and practices were analysed at state and county level, taking into account the residence requirements as outlined in the new integration law. The project was funded by Stiftung Mercator. The results were published in November 2016. Arriving and Staying in Germany: Facilitating Integration by Assigning Place of Residence? Since 2010, Berlin, North Rhine-Westphalia, Baden-Württemberg and finally Bavaria have each passed legislation on integration at the federal state level (Land level). In other Länder, legislation of this kind has been called for, announced or discussed. The contents of the individual laws are different, but what many of them have in common is that they establish institutions and processes to formulate and implement integration policy at Land and municipal level. This includes regulations on integration commissioners and advisory councils as well as cooperation and coordination structures between Land and municipalities, participation opportunities for people with a migration background as well as guidelines for government authorities. The research project analysed and compared the existing laws and aimed to answer the question of whether integration laws are a useful instrument to more effectively manage integration and participation policy. The project was funded by the Stiftung Mercator. The results were published as a Policy Brief in October 2017. Due to the drastic increase in the number of refugees in Germany over the last few years, the absolute number of people obliged to leave Germany has also risen. It is therefore to be expected that the municipal immigration offices (Ausländerbehörden) will be increasingly faced with the task of organising and carrying out departures – be it deportations or support and financing for assisted voluntary departures. The goal of the project was to outline the different approaches to terminating residence using examples from three federal states (Länder) and to look at how they are carried out by the municipal immigration offices. One particular focus was the question of the importance attached to assisted voluntary departure or deportation, and how both options can be incorporated into concrete policy for terminating residence – for example, as a strategy at federal or Land level or for practical implementation by the municipal immigration offices in municipalities or districts. Special emphasis was placed on what is known as assisted voluntary departure which is generally considered the more “humane” and inexpensive variant of return. The study thus also aimed to contribute to bringing more objectivity to the public debate. The research project was funded by the Stiftung Mercator. The results were published in March 2017. First- and second-generation migrants account for one in four students at German universities today. Apart from tens of thousands of ‘educational nomads’ who are drawn to Germany every year because of its study programs, ethnic diversity is largely home-grown as more and more second-generation migrants flock to the country’s universities and universities of applied sciences. However, despite notable interest from policy-makers and higher education leaders, very little is known about the experiences and day-to-day challenges of different groups of migrant students. Recent studies have shown that migrants in Germany are not only less likely to attend higher education, they are also more likely to drop out of study programmes. In order to find out more, the Expert Council’s Research Unit set out to analyse the educational experiences of migrant students. 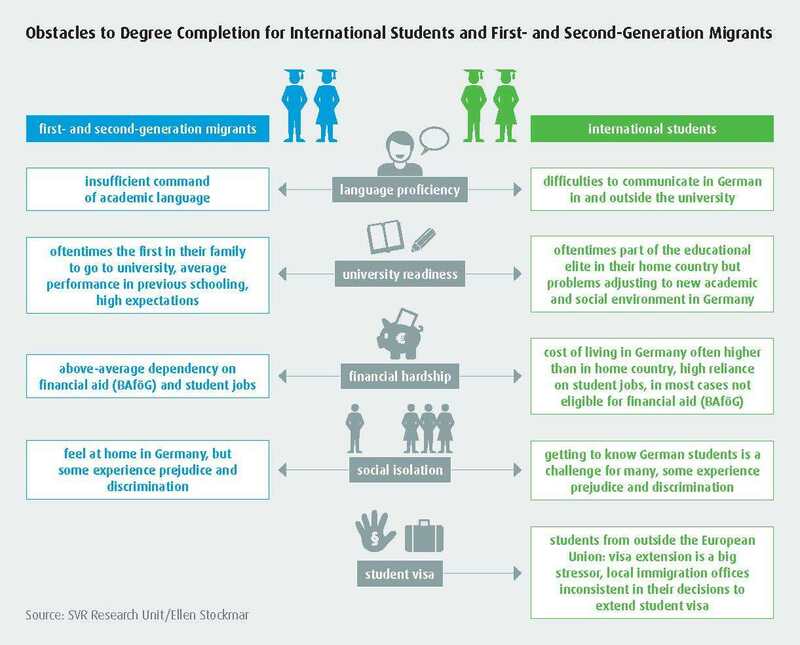 Based on the analysis, (policy) recommendations were developed, aiming to improve the educational opportunities of first- and second-generation migrants in Germany. The project was funded by Germany’s Federal Ministry of Education and Research. The results were published in May 2017. Subjectively perceived discrimination based on origin is a significant indicator of equal participation in an immigration society. Earlier findings for Germany show that migrants from Arabic-speaking regions of origin and Turkey report more often about perceived disadvantages than do people who immigrated from, for example, Eastern Europe. For Germany, it remains unclear whether and to what extent migrants’ perceptions of discrimination, which differ depending on their group of origin, are related to a physical appearance that suggests that they may have immigrated. For example, do people who are associated with a migration background due to their skin colour or a headscarf feel more discriminated against? This question was investigated on the basis of the SVR 2016 Integration Barometer. The project was funded by Stiftung Mercator. The results was published in January 2018. How do international students experience their post-study job search in Germany? How do these experiences differ from their initial expectations? And what are the effects of these experiences on former students’ intentions to stay in or leave Germany? The two-year research project featured the first-ever longitudinal analysis of the study-to-work transition of international students in Germany. Students were surveyed toward the end of their studies and 18 months later, i.e. the maximum duration of Germany’s post-study job search visa (Section 16 subs. 4 Residence Act). This way, the Expert Council’s Research Unit seeked to compare international students’ attitudes and expectations toward finding employment in Germany with their actual post-study experiences. Furthermore, migration patterns both in and outside of Germany were analysed. The project was funded by Stifterverband and Stiftung Mercator. The results were published in December of 2017. Currently, less than 1 percent of the more than 17 million cross-border refugees worldwide are resettled every year, whereby they attain permanent protection by a third country. In Germany, a permanent resettlement programme has been in place since 2011, offering a safe route to Germany for several hundred people every year. In order to establish a common European policy, the European Commission submitted a proposal for an EU resettlement framework in July 2016. And in 2018, Germany will co-chair the international Annual Tripartite Consultations on Resettlement. In addition, the UN General Assembly is slated to adopt the Global Compact on Refugees. In view of these developments and the increasingly important role of Germany in the debates on the further development of the European and international refugee protection system, the SVR Research Unit was examining the recent developments and most important challenges of the current resettlement policy at the German, European and international levels. In consideration of document analyses and background interviews, the Research Unit has developed policy options and recommendations for action that are directed primarily at decision-makers in politics and administration but also at civil society actors. The project was funded by Stiftung Mercator. The results were published in June 2018 in the form of a policy brief. In Germany, a growing number of universities is affected by general demographic decline and the ensuing drop in domestic students. At the same time, the number of international students is on the rise, totalling more than 280,000 in 2018, or 10 percent of the country’s student population. In this project, SVR’s Research Unit takes a closer look at universities which are aready experiencing a decline in their domestic student intake, many of which are located in shrinking communities. By analyzing how these universities recruit and prepare international students, this project seeks to assess the stabilizing capabilities of select internationalization practices. Since the number of shrinking communities – and, as a likely result, the number of shrinking universities – is projected to increase across Germany, this project aspires to shed light on how universities and higher education systems can increase the effectiveness of international student recruitment and improve their academic success. The research project is funded by Germany’s Federal Ministry of Education and Research. The results will be published in March 2019.